Welcome to The Ballpark in Arlington Renovation Project! This site is just a wild idea I had one day while watching a Rangers game. I finally put the idea on paper...and now on the Internet. This is completely my idea and my idea ALONE. This site, IN NO WAY, is representative of the Texas Rangers, The Ballpark in Arlington, Southwest Sports Realty or the City of Arlington. It's just a fan's idea on what could be done to help make The Ballpark the best baseball stadium in the country! When you're finished navigating the site, be sure and click on the "Poll, Guestbook, Contact" link on the navigation menu. It's a page set up for you to voice your opinions on The Ballpark! This site is easy to navigate. As you read each page, the link at the bottom of each section will take you to the next page. If you want to skip through the site, use the navigation menu on the left-hand side. Simply click "Intro" to start. Did You Know? : Click to View List Entries. The Ballpark Project is under a week old and we're already getting noticed by the media. 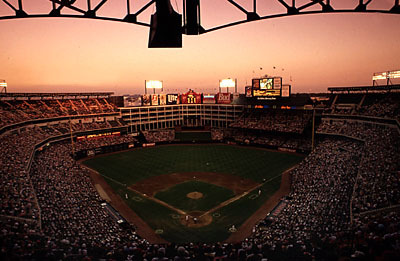 On Friday, June 8th, The Ballpark Project was mentioned on The Norm Hitzges Show on Dallas/Fort Worth's SportsRadio 1310 The Ticket. Check out the "Links" page for a link to The Ticket's website.